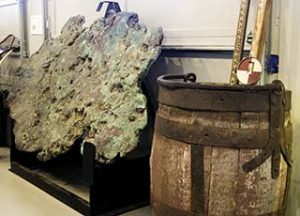 In addition to small size mineral specimens the museum has large objects such as the car in the background that tells the story of the wreck of the S.S. Bangor. The history of the Keweenaw is a complex mixture of mining, shipping, tourism, and the struggles of everyday life on America’s early ‘Western” frontier. The Keweenaw History museum contains displays that look at each of these areas. The Eagle Harbor exhibit shows photographs of the development of Eagle Harbor from a mining then lumber community to an early tourist destination. The history of mining is displayed through photographs and artifacts that trace the 6,000 year old history of mining in the Keweenaw. The wreck of the S. S. Bangor in 1926 near Copper Harbor and its load of Chrysler automobiles is examined in detail. Life in the Keweenaw is shown through photos, art works, and even an early Copper County automobile. The Keweenaw County Historical Keweenaw History Museum is located on the grounds of the Eagle Harbor Lighthouse complex in Eagle Harbor, Michigan. It is located in the old Coast Guard garage building on the site. 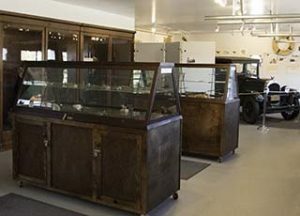 The Museum has objects ranging from local art, artifacts, minerals, and mining items such as float copper and a wooden kibble. Since 1982 the Keweenaw County Historical Society has maintained four museums at the light station. Besides the lighthouse, they include a Maritime Museum in the old fog signal building, a Keweenaw History Museum located in the old U. S. Coast Guard Station garage, and Commercial Fishing Museum located in one of the assistant keepers buildings which was moved from the original Lifesaving Station across the harbor to this site when the station closed. Hours & Admission – The Keweenaw History Museum is part of the Eagle Harbor Lighthouse Complex and is open from mid-June to early October. Admission $5.00. Children free. Check the Site and Museum Schedule page for specific hours of operation. Related Links -You may wish to explore the following sites for additional information on the history of the Keweenaw. NOTE: The State of Michigan has E.W. Courter’s 144 page complete Keweenaw history, ‘Michigan’s Copper Country‘ on the web as a PDF.